You may recollect back in January we brought you a preview of a cute little platformer coming soon from Majesco called Monster Tale. 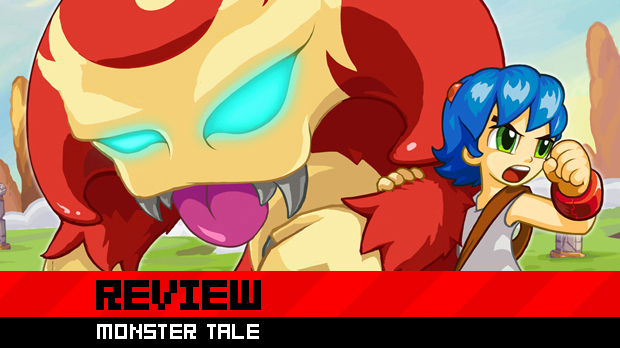 A sweet title with distinctly retro flavor, Monster Tale used some cool tricks to keep us exploring Metroidvania-style, a cute sidekick to ward off loneliness, and a happy soundtrack to keep us tapping our feet. If the read the preview, you know we dug it -- and that we wanted more. Fast forward a few months, and the full game is here for us to check out in its entirety. I sat down with it a second time, happy to be able to play all the way through. When you hear that the team behind a game is the same as the people behind the award-winning Henry Hatsworth series, you tend to sit up at take notice. That is the case with Monster Tale, and what we got out of the preview was that that pedigree definitely made for some great gameplay (at least for the early levels we checked out). But could they hold up the quality for an entire game? In Monster Tale, you play the role of a plucky young girl named Ellie who is whipped away by magic to a world populated with semi-threatening monsters. Ellie makes a friend named Chomp, who will be her companion for the rest of the game, and also doubles as an excuse for a ton of really interesting interactive game mechanics. 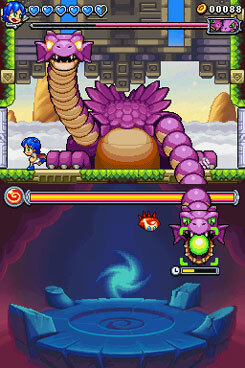 The concept behind Monster Tale is still a simple one, but thanks to Chomp, it'll keep you busy! Ellie and Chomp's main mission is to defeat the Kid Kings, who are actually children from Ellie's real world that have gotten their hands on a bit too much power. To do that, you're going to do a lot of back and forth platforming, similar to the style of Metroid and old-school Castlevania. If you've played any Hatsworth title, you're sure to see the influence here, as Ellie kind of moves a lot like the old chap, but the differences are enough to make it feel like its not a bite stylewise. 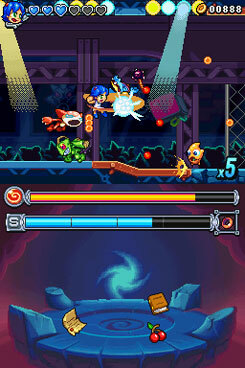 Ellie defends herself in the game by using a band which powers up through the use of different abilities she gains as she progresses. You'll get a little fireball spell to start off, as well as a melee attack. Once you meet Chomp, you can rock out with all kinds of new powers, because he interacts with Ellie in a such a way that it really opens up the possibilities of what you can do during play (although it won't be that way right off the bat ... give him some time to develop!). 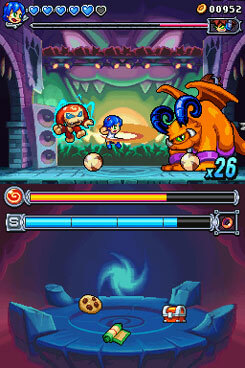 He's pretty good just as a sidekick who stomps baddies alongside Ellie, but after Chomp evolves a bit, he can do a lot. You can stick with his original form, which kind of looks like a Croissant with cute eyes, or you can change to different forms later down the line. Each of the forms earns experience separately, so you'll need to be handy with swapping out abilities and making sure you give all of his forms some fighting time. Otherwise, you won't be able to access all the cool stuff he has to offer. Speaking of using Chomp, you'll need to be aware of his petmeter as well. When he is on the top screen fighting alongside Ellie, he gets tired. However, he has a cool little mancave on the bottom screen called the Pet Sanctuary, and you can send him there with a touch of the X button. He'll regenerate energy there, and any pet items you find during your travels will also be found down there. If he goes down to eat them, he'll get little stat boosts to experience, use them as weapons, and more. Plus, it's really cool to watch him eat. Boss battles in Monster Tale feel just like playing the Super Nintendo, from music to boss size (as you would hope, they mostly fill the screen). If you played that system when it was in its original run, you're going to swoon over that nostalgic feeling. I know I did, and it reminded me of some good old times back in the day. As for gameplay, it flows forward in a pleasant manner. I found Monster Tale to be moderately challenging, but never quite as much so as Hatsworth was, so this is obviously aimed at a slightly different audience. One thing the game does do is handhold, which will either be handy to you or piss you off, depending on what you prefer. It'll always tell you where to go next and show it on the map. I personally like this as there are times where I forget where I've already been in this map style, and it can be useful to have a guide. One thing I did not like about Monster Tale was the backtracking. You'll revisit each area at least once, and Ellie's not exactly a speed demon. That's okay, though, because the fun of the game's partner mechanic and ease of play far outweigh the annoyance of having to retrace your steps a few times. If there's any major weakness the game has, its that its almost too simple, but I get the feeling that DreamRift wanted it to be something both kids and adults could enjoy, and it certainly fits that bill. A full playthrough lasted us about 8-9 hours, which was plenty of amusement for the price.